A private beach ultra-plush rooms and sterling service have our guests raving about the lavish Mandarin Oriental Miami a smoke-free hotel overlooking downtown and Biscayne Bay. The 15-floor luxury hotel has 329 spacious guestrooms featuring 10-foot ceilings and all measuring at least 400 square feet. Beds are sinfully comfortable with luxury cotton-rich linens and pillowtop mattresses. Bathrooms are done in Spanish marble tile with bamboo accents and feature separate tubs and showers. The Mandarin features flat-screen TVs CD/DVD players and iPod docks. Wireless and wired Internet is available for a surcharge. There's a lovely 20000 square-foot private Oasis Beach Club overlooking Biscayne Bay. It features a pristine white-sand beach infinity-edge swimming pool and spacious sundeck with day beds and chaise longues. Guests can rent private cabanas with flat-screen TVs and butler service or dine alfresco at the open-air sushi bar and grill. The hotel also features an award-winning spa a state-of-the-art gym and an outdoor fitness path with waterfront and city views. 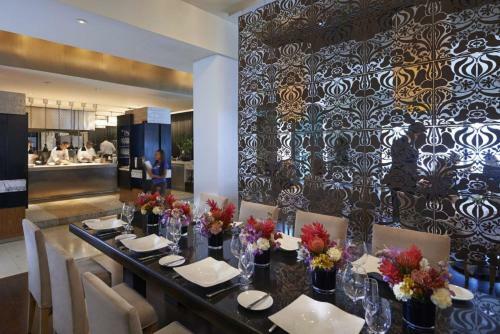 The Mandarin Oriental is a 15-minute drive from Miami International Airport. The hotel is situated on Brickell Key at the mouth of the Miami River in downtown Miami. Bayside Marketplace is one mile from the hotel and the South Beach party scene is three miles across the bay. discover all that Miami can offer you!